Who doesn’t love popcorn?! I mean really!… It is such a delicious and addicting snack food! My family LOVES popcorn. I am going to let you in on a little secret. Popcorn is one of my husbands go to snacks. He will pop some up and then alternate different seasonings we have in our home. We love the stuff! My hubby went on a business trip to France recently, and so I went and crashed with my parents for a couple days. There is a 14 year gap difference between me and my younger siblings so 2 of them are still in grade school and depend on after-school-snacks for their sanity! (okay, not really their sanity… but there is nothing like coming home after a busy long day to a yummy little treat waiting for you.) Anyway, my mom went out with her sister for the day and wouldn’t be back in time for them to come home… so I took the liberty of pulling together a yummy, fast, and tasty snack! I found this delicious popcorn recipe over at The Cupcake Theory and it was absolutely wonderful! The verdict… we all LOVED it! A fast, easy and delicious snack! Whips up in no time at all! Pop popcorn until done, remove any unpopped kernels. Add brown sugar, corn syrup, vanilla and marshmallows. Turn heat to medium and stir until marshmallows are melted and mixture is smooth. Pour over popcorn and stir in until popcorn is evenly coated. Whew, that popcorn looks soooo good! I love how gooey it looks, melted marshmallows are always a hit. I pinned this recipe! Thanks Nikki! This picture has me drooling! This is exactly what I want when I sit down this afternoon with an exciting book! Love your blog! Storage instructions. You crack me up. You also left this out: Serving size = 1. I had to LOL at your comment! Serving size= 1 sounds about right! I agree - this looks so good - but doesn't it have to be baked in the oven like other 'covered' popcorn? Does it get hard enough to not be sticky? I am a nerd - I didn't realize you said UNpopped popcorn - oops! Sorry - have you ever used microwave popcorn and if so, do you know if it is a bag or 1/2 bag? haha its okay! I overlook things like that all the time. But yes was UNpopped Popcorn :) I updated it to a bag. If you make it, let me know how it turns out for you! Nikki, this popcorn looks insanely delicious + addicting. I don't think I'd be able to stop eating it! 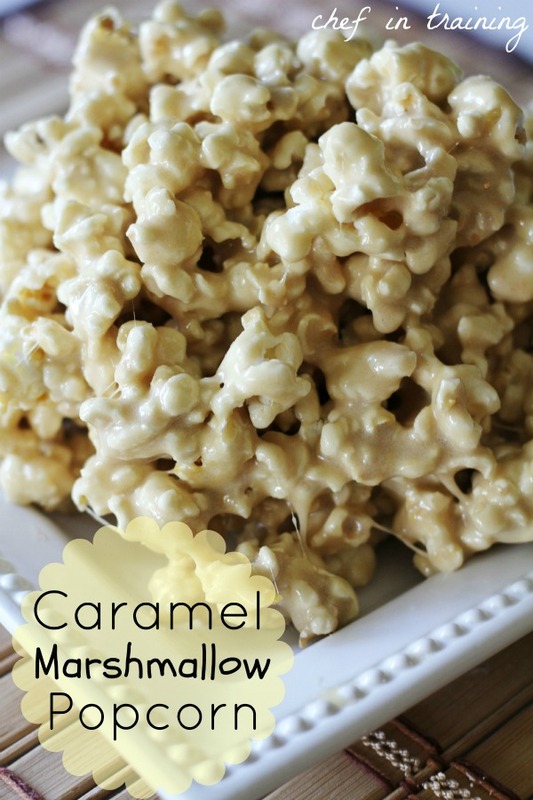 I love caramel corn as is but adding marshmallows just takes it to a whole other level. LOVE! Just saw this on pinterest and made it as a late night snack... It tastes like Disneyland! Genius. Thanks for the easy, yummy recipe! I think this would be a great dipping sauce for fruit!!! Omg we made this tonight and we ate ourselves sick. It's awesome but very hard to put down. I'm going to make a bunch for my next family party and hopefully it will be a hit with everyone. it right away. However, I did with this one. Simple, sinful, and delicious! My grands will all love it! Are you sure you're just a 'chef in training' ??? yum, I love to add ins to my popcorn, I'll try it for sure. Made this snack today for our Rainy Movie Day. So delicious! Thanks for sharing! Tried this and mine looks almost exactly like yours. BUT when it gets colder, it got sticky and very hard. And the caramel also stuck to my teeth. Very yummy, nonetheless. Does it matter what kind of popcorn is used? I have "movie theatre butter" popcorn? Is that too much butter for this recipe? I used and would recommend just plain popcorn. The ooey gooey flavor is amazing as is and the butter flavor might make it taste a little off or a little too buttery. But if you do, let me know how it tastes for you! So goooooooooooooooood! The kiddos loved it. Thanks for sharing! Also I used butter popcorn and the corn syrup option. I can't taste the butter on the popcorn. Taste like popcorn rolled in a mary jane. My only comment/suggestion would be to lightly spray the bowl you're going to use with Pam. Despite being delicious, it stuck hard to the bottom of my bowl. This is absolutely wonderful!!! I love the flavor - but think next time I may try 2 bags of popcorn and spread the calories a little further around! YUM! I stopped on the way home from work today and bought the ingredients to make this. Its really tasty but gooey. I think like Vicky I will use 2 bags of popcorn next time. Im wondering if you use less butter it will be less sticky? This recipe is so easy and it tastes AMAZING! One bite and you're addicted! Love it! Pretty good. Made this with 2 bags microwave popcorn. One was light butter , the other heavy butter. I've made this without the corn syrup and it was stickier I'm glad I found this recipe. Much better. I could still cut the brown sugar to 3/4 C instead. Very very sweet. This was absolutely delicious and sinful! I do not get addicted to sweets much, but this was something that I just couldn't put down. The only problem I had... was when the mixture cooled it got really hard. I mean really hard that it was like a battle to pull apart. I thought maybe the next time I make them into popcorn balls or clusters to solve the problem, but I am not sure why this is happening when it seems like no one else is having this issue. Ideas? I took your advice, and other's comments about it becoming super hard, and made them into popcorn balls, and they turned out great. I think the reason why nobody else seems to be having this problem, is because a lot of people made it, and served it right away. I was making it for a meeting later that day, so I found your idea to be a perfect solution. Thank yoU! I made this today as a fun snack for my kids... They are in love! It was good! It is very hard once it dries but it was fine. I made one bag of popcorn and halved the recipe for the topping. It might be good with some cinnamon thrown in there. I will have to try that! Made this popcorn for my boys today and it is soooo yummy! Thanks for sharing this recipe! Just made this this morning and I love it! Such a great snack and I love the creaminess the marshmallow adds. It's sticky and gooey and so much fun to eat! I think it would be great to form into balls for a party favor, or to use the topping over rice krispies too! Ohhhhh....a perfect topping for rice Krispie treats! I normally just melt chocolate chips and peanut butter and spread that over my rice Krispie treats, but this would be such a great topping too! Hi, your popcorn recipe looks great, might give it a try, Have you ever used like a red jello to make popcorn balls? Well I have one that is really yummy to. I guess you could use any color you would like, I make them red #1 because I like the cherry flavor, plus I make them mostly around christmas time. If you would like to know how to make them, just ask, And I will give you the recipe. It's kind just in my head. Thanks for your recipe. Pamela. I made this as a late night snack and it was great, but I would change a couple of things for the next time around. I would DEFINITELY use 2 bags of popcorn, instead of one. and I would probably cut back on the butter and sugar just a little bit. But overall it was yummy!! My 11 year old son and I made this tonight. It was so yummy!! Thanks for sharing! Normal caramel corn is baked at low temps for about an hour to get crispy and not stick in a ball. Could you do that here, or the addition of marshmallows make that not possible? Saw this recepie on Pinterest. It's the best popcorn I've ever had! My whole family loves it! It's super easy to make too, can't wait to try the Oreo one! Thanks for this recipe. It is both easy and delicious. To make it even easier, I made the sauce in the microwave. Ok! So I never leave a comment on these pages and I just have to tell you I LOVE THIS RECIPE! We made it for my sister n laws baby shower but drizzled chocolate on it and it was a HIT! Thanks for sharing it! This recipe was delicious! The only thing I did differently was spread it out on a cookie sheet and sprinkle a little salt over it. The salt made the flavors really pop and spreading it out helped cut down on the sticking problem. O. my. gosh. This is soooo good. Made tonight instead of the usual poppycock I make @ Christmas. I added mixed nuts as well.. Super gooey & delicious!! Thank you for posting this recipe! I tried the recipe this way but it became hard to fast, so instead of marshmallows, I tried condensed milk. So good! I have made this twice now! Simple and easy! I used 2 bags of popcorn and spread it out on a cookie, then drizzled the mixture over the popcorn. Flipped the popcorn over a few times to coat it and so good!!!! Take some plastic cellophane bags from the dollar store and voila!... an easy Christmas gift for all those co-workers! I made this last night after seeing it on Pinterest for a while and OH MY GOODNESS!!! That was some mind-blowing delicious snack food!!!!! This is some serious eye candy! It looks like it just melts in your mouth. I love it! It is great for an Oscar party so I had to blog about it! I ran across this today while looking for something to do...so I did it. I did make a few changes for my personal tastes. I only used 3/4 of a cup of brown sugar and more popcorn. I also added some sliced almonds and a 1/2 teaspoon of Cheyenne Pepper. I like a little heat with my sweets sometimes. Turned out rather nice...so I made them into balls for ease of handling and storage. For those who might not know, these will be gooey in nature. The sugars are not cook to a high enough degree to let it stay hard when finished . But all in all...very happy with the receipt. THANK YOU! I made this as a late night snack one night while home alone. Big mistake. I managed to save a few morsels to share with the family the next day (I really mean few), they all loved it and couldn't stop eating it either. I later made another batch to share with co-workers, who all asked for the recipe. This popcorn is the best! I'm ready to make some right now, but I that would be a terrible thing to do to myself...wouldn't it? OMG! My son and I made this, I threw in a hanfull of cashews and sprinkled it lightly with some sea salt. It is so yummy and it was quick and easy! Thanks for sharing this! Wow, when I was a kid we used to make popcorn balls with melted butter and melted marshmallows poured over popcorn and then sometimes we would forget making the balls and just have a big pan of marshmallow popcorn. I love caramel so I can't wait to try this version! Thanks for bringing back the memories! I tried this last night with a group of friends. It turned out yummy! I used 1 bag of popcorn & halved the caramel mixture. It does harden up pretty quick & stick to the bowl some, but it was great! I just came across this. It looks like a supremely ooey, gooey, yummy recipe. I'm looking forward to trying it. Though I was bummed to see bagged microwave popcorn as an ingredient instead of fresh kernels that you pop yourself on the stove top (or in a microwave popcorn popper). The bagged stuff is SO unhealthy! Please consider recommending kernels next time :-) And whenever making a candy coated recipe like this, think about using Mushroom Popcorn kernels instead of regular butterfly kernels. You'd be amazed at the difference in the end result! I was thinking the same thing. How much popcorn would one use instead of "1 or 2 bags" 3-4 cups?? I just I could just make a big batch and play with it. I was wondering the same thing. Can you use Marshmallow Fluff, instead of 12 large marshmallows and if so, how much would you use? I had EVERYTHING in my pantry and for the first time in my life... I did not have butter. Only margarine, which I never eat. (it was given to me) I wanted to make this sooo bad, but at 11:45 pm I can't run to the grocery store. It was closed already!!!! Oh well, I'll make it tomorrow, Sunday for Football and Nascar Race!!!!! So making this! Wondering if anyone has used honey instead of corn syrup? Saw one comment that used honey but wasn't clear if corn syrup wasn't used too?! Don't have issues with corn syrup....just don't have any! Thanks so much for ALL shared recipes and suggestions. LOOKS GREAT! I opted to use the Honey instead of Corn Syrup (GMO's and all) and I also used air popped popcorn instead of microwave stuff (chemicals). It was delicious with that hint of honey flavor. Gotta figure out how to make it so it gets hard and can be separated though, it's just to soft and sticky now since storing in a covered bowl. It isn't supposed to get hard enough to be separated. Its meant to be sticky. Thats the premise of this recipe. I too, am a popcorn 'fanatic'. I enjoy it any time of day. I never attend a movie with out a large bucket of popcorn on my lap. This recipe sounds scrumptious! I prefer popping my own corn, so I am going to try it with the stovetop popcorn. I am sure it will be just fine and dandy. Hey, it's popcorn, is it not!!? I'm assuming after step 5 this goes in the fridge to set??? Its not meant to actually be set... It is a goody kind of caramel corn... will remain sticky... and its delicious! recommendations with hardening and stickiness . Does it help to spread on cookie sheet.? Mine was sticky because I put too many marshmallows in it so I spread on a cookie sheet. I then pulled it into smaller pieces. It came out a bit like rice krispie treats but it was delicious. Everyone... This isn't supposed to be a hard kind of Caramel corn! The recipe is designed so it retains it's stickiness. Do you have to use corn syrup or is there a subistute? Beyond delicious!! Can't stay out of it! Thanks for sharing! what kind of popcorn? Plain? Have made this a few times now and we love it. Popcorn is my husband's favorite, he requests this frequently as a snack. Thanks. Love this popcorn recipe, and so does my extended family. Thank you. Hi, Could the ingredients be melted in the microwave, if so for how long. With all the sugar in this popcorn recipe did. You have to peal your siblings off the ceiling after the rush? Do you know how many mini marshmallows to use in place of the 12 large? Even how many ounces? This looks delicious, can't wait to make it. SO GOOD. My family loved it and kept sneaking over to get another bite :) I defiantly recommend this for a quick yummy gift or for an occasion. This is really delicious. Definitely take the time to pick out the unpopped kernels. I don't use microwave popcorn. Nothing beat on the stove popcorn the old fashion way. This should still work right? I love popcorn. I usually make a big pot and i love putting Nutritional yeast on it. Sooooo Yummy. Too much sugar and butter! It's enough to use half a stick of butter and 1/4 cup of sugar. It still covers an entire bowl of popcorn. 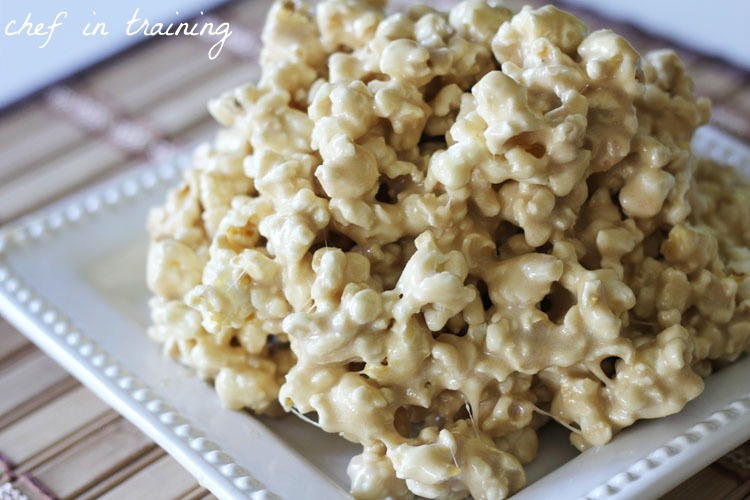 Other than that, this is my favorite sweet popcorn recipe! I make popcorn balls every fall. My go to recipe is 20 large marshmallows, 1 stick butter and 1 cup of light brown sugar. Melt and pour over salted corn. I use a large roaster to put it in and only use white popcorn. This makes enough for around 20 balls, depending how large you make them. Butter your hands so they will not stick. They do not get hard. I also put them in individual sandwich baggies.